Ernest Shackleton had a penchant for being in the wrong place at the wrong time. His three attempts to reach the South Pole each failed for a different reason. After Roald Amundsen succeeded in planting a Norwegian flag on the Pole, Shackleton shifted gears and decided to become the first man to make a transcontinental crossing of Antarctica. Through pure bad luck the attempt foundered, and it was only Shackleton&#146;s leadership that prevented complete disaster from overtaking his party. But his return to England was a muted one: by then Europe had plunged into World War I, and the wholesale slaughter there took the shine off any distant, bloodless achievements. For decades the story of Shackleton&#146;s expedition has gone largely unnoticed, and it&#146;s only been in recent years that one of history&#146;s great survival stories has begun to receive the attention it deserves. 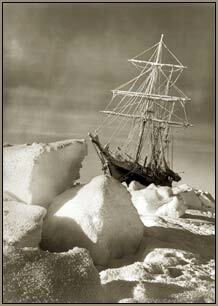 George Butler&#146;s The Endurance: Shackleton&#146;s Legendary Antarctic Expedition helps to correct this injustice. This 93-minute documentary traces the early portions of the Irish-born Shackleton&#146;s career, sketches in the character traits that would serve him (and his crew) so well, and sets the stage for the ill-fated yet magnificent expedition aboard the aptly named Endurance. From our perspective, a hike across Antarctica may appear to be a frivolous exercise in redundancy&#151;a bungee-jump from a high-rise&#151;but Shackleton&#146;s attempt came at the end of the great age of exploration, when people were still feeling their way across the face of the earth. He solicited his crew using a newspaper ad that downplayed the monetary rewards and highlighted the physical perils that the expedition could expect. With a crew of 27 men, 69 sled-dogs, and a ship&#146;s cat named Mrs. Chippy, the Endurance&#151;a three-masted barkentine specially fitted to break through ice&#151;set sail from Plymouth on August 8, 1914. As the ship plowed through the Weddell Sea towards its landing point, it had to pick its way through unusually heavy pack ice that formed &#147;a gigantic and interminable jigsaw Puzzle.&#148; An intense gale drove the final pieces of that Puzzle into place, trapping the Endurance only a day&#146;s sail from the continent. (The Donner Party was also a mere day short of passing through the Sierras before the blizzards closed in on it. Nature may be even more heartless than its reputation would have it.) For 10 months the ship sat as if set in cement, and as the currents revolved the gigantic plate of ice in a northerly direction, the men maintained morale by organizing soccer matches, theatrical evenings, haircutting tournaments. In the meantime, in addition to all of his other responsibilities, Shackleton was having to face down the mutinous ship&#146;s carpenter. Finally the ice brought its pressure to bear, crushing Endurance like a car-compactor, and leaving men and animals alike drifting on an oversized floe. The temperature was 15 degrees below zero. As spring came and the ice began to break up beneath their feet, the men had to take to the lifeboats they had pulled from the old ship. They made for the closest landfall, a pitiful pile of rocks far from any shipping lanes called Elephant Island, where they survived on a monotonous diet of penguin and seal. Shackleton hand-picked five stalwarts, including the mutinous carpenter, and set sail in one of the lifeboats over 800 miles of thrashing sea for the closest inhabited land. Once they reached South Georgia Island, the band still had to pick its way across the glaciers and crevasses standing in between them and the whaling station on the island&#146;s far side. Having arrived, it still took Shackleton four attempts before he could return to Elephant Island and pick up the rest of his crew. The men had survived nearly two years trapped in the most miserable conditions imaginable, and they almost immediately fell out of the public mind. Butler uses such tried and true techniques as interviews with the crew&#146;s descendants and new footage of the expedition&#146;s settings to tell Shackleton&#146;s story. Liam Neeson&#146;s understated narration baldly recounts the basic facts: the men moved here and did this, then they moved there and did that. These parts of the film are informative (we learn, for instance, that the sentimental crew actually turned the ship around when Mrs. Chippy fell overboard), but they aren&#146;t particularly compelling; they don&#146;t have any of the fever-dream ambience that Ric Burns used to pull viewers into The Donner Party. But Butler has an ace up his sleeve that most documentary makers would kill for: photos and film footage of the actual expedition, taken at nearly every stage of its proceedings. One of the crew members was Frank Hurley, a professional photographer whom Shackleton engaged to document the trip. Hurley was more than a reporter, though&#151;he had an artist&#146;s eye. Even his quotidian photos, such as the one that shows the men dwarfed by a flayed whale&#146;s carcass, are striking, and his material gives us a way to feel in concrete terms what the men of Endurance went through. The ship in its death throes as the ice closes in on it, the men on Elephant Island waving a hopeful fare-thee-well to the lifeboat as it pulls away, the forlorn survivors scattered about a rocky beach, surrounded by the remains of decomposing penguins&#151;these are only a few of Hurley&#146;s images that fill out The Endurance. Most memorable of all might be the series of exposures he took of Endurance before it began to cave in. In a vision out of a Coleridge poem or an opium dream, the wooden ship stands erect, caught fast in a world of whiteness, a thing out of place and now out of time. Expressive of both its master&#146;s persistent nature and the fragile nature of our best-laid plans, these surreal images&#151;simultaneously mocking and heroic&#151;by themselves make The Endurance worth seeing.